On February 1 at the Prefectural Office, the plaintiffs deliver their report and submit their brief for the appeal. 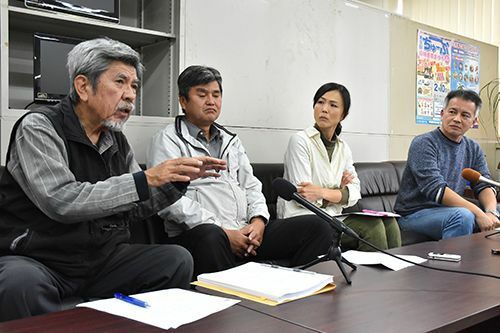 A group of U.S. and Japanese environmentalists, which is the plaintiff group in the dugong lawsuit against the U.S. Department of Defense (DoD) and demands a halt to construction in Henoko, Nago City, held a press conference on February 1 at the Prefectural Office in which it has reported the submission of its brief to the U.S. federal court of appeals. Following the judicial decision made in August last year, the plaintiffs are again claiming that the DoD failing to hold discussions with local interested parties is in violation of the National Historic Preservation Act (NHPA). It is expected that the DoD will submit its brief to the court after about a month. There are more than 100 pages to the plaintiffs’ brief submitted on January 2. The plaintiffs also claim that the report from the DoD stating, “new base construction will have no negative effect on the dugong” violates the procedure established by the NHPA, and is an arbitrary argument. Member of the Nago City Assembly and one of the plaintiffs, Takuma Higashionna, said, “Actually, the dugong have left. This outcome should never have come about, if only the Department of Defense had listened to local interested parties. Initially, the DoD planned to submit its brief documents by February 1, but it has been delayed due to the U.S. government shutdown. After documents have been submitted, the court will decide on matters such as the exchange of additional documents and about holding a public trial.